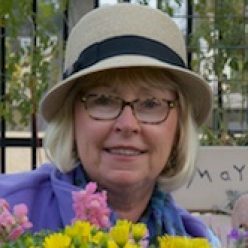 I arrived on Mackinac Island for the 70th annual Lilac festival in June 2018. The ferry ride takes about 30 minutes to reach the island and it was a blue sky, puffy white cloud day with calm waters day. 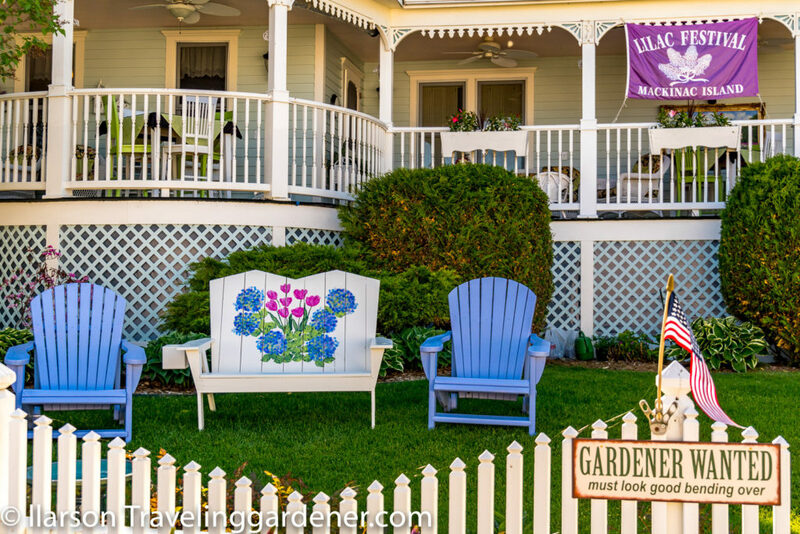 The entire island blooms with lavender, pink, white, & deep purple lilacs. It is a spectacular sight, there is a wonderful scent and the blooms are lush perfection. The enormous bushes grow everywhere in the limestone-based soil. 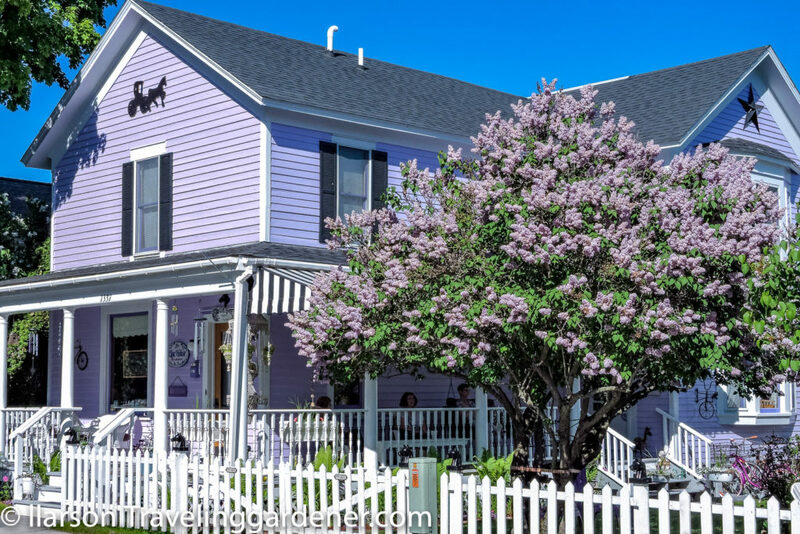 This is a lilac “bush” beside this 2-story house. 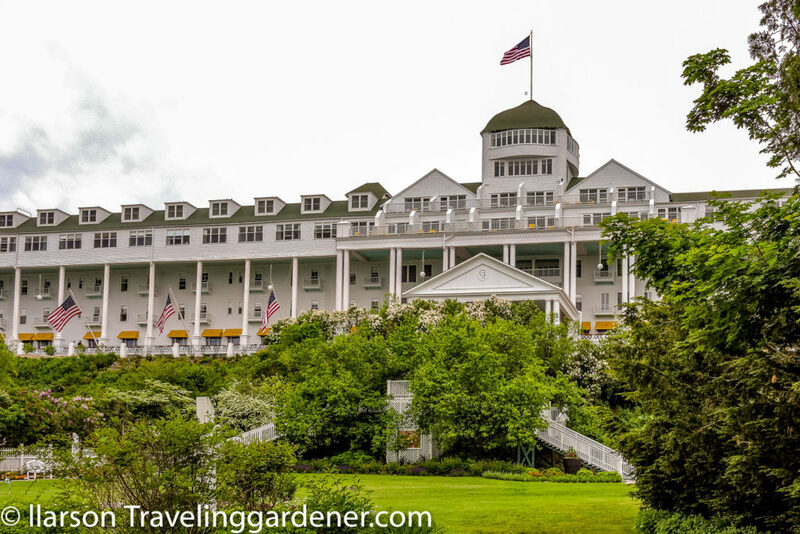 The Grand Hotel stands majestically on the coast of Mackinac Island. 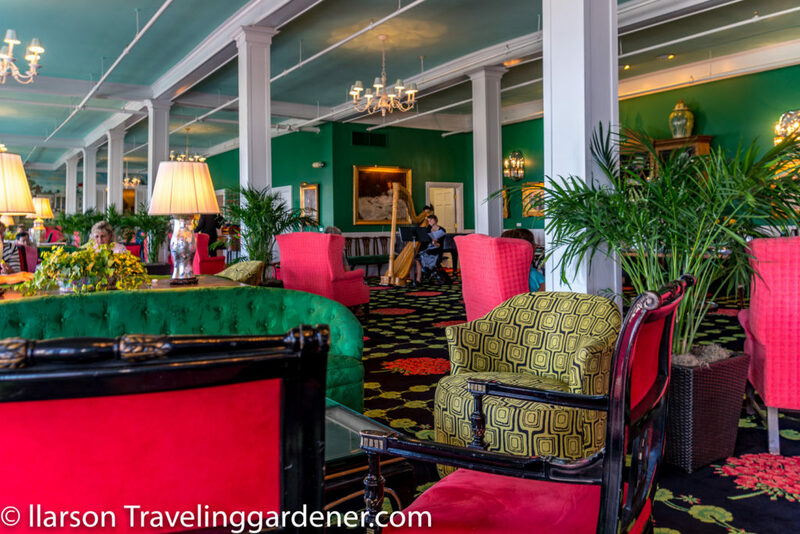 Welcoming guests since 1887, it claims it has the world’s longest porch. 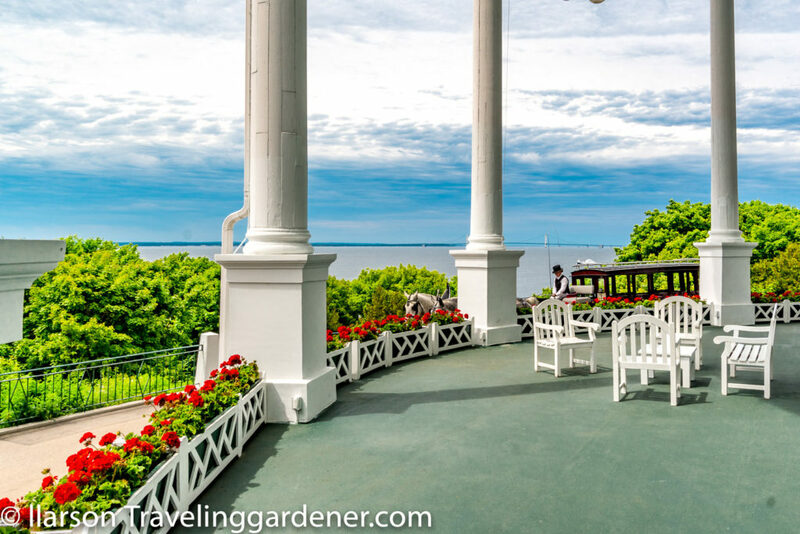 Relaxing in the big white rocking chairs overlooking the straights of Mackinac is a wonderful way to spend an hour. Inside you walk on carpets of flowers. 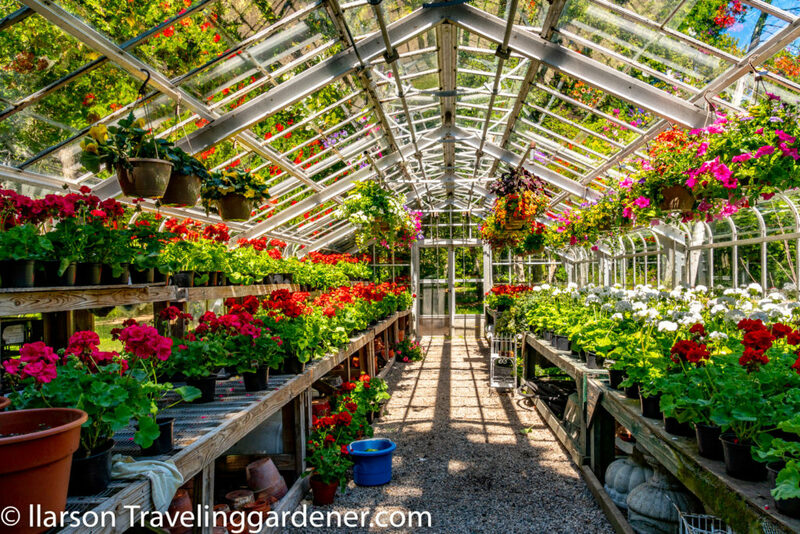 The Geranium Bar is kept in fresh flowers from this greenhouse. Blue water, white puffy clouds, and red geraniums celebrate summer. The scent of lilacs in the air, where else could I be so happy? 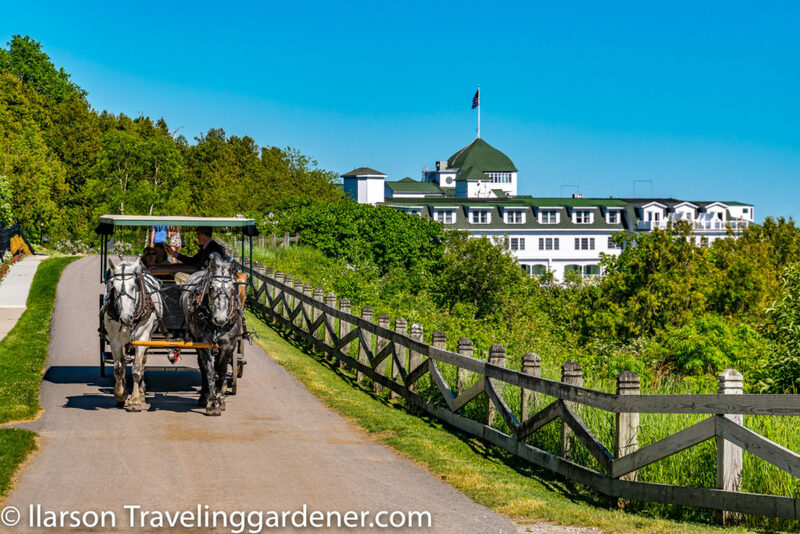 Mackinac Island, a car-free island celebrates the horse-drawn carriage and yes the horses add to the scent in the air. The other scent of the island is fudge, I don’t know why but it is sold everywhere fortunately I have a complete aversion to fudge. So the lilacs are by far my favorite scent in the air. Years ago when I was first married I lived in Southwestern Colorado on a small hill looking out at three magnificent mountain ranges, Mesa Verde, the Sleeping Ute and the San Juans. 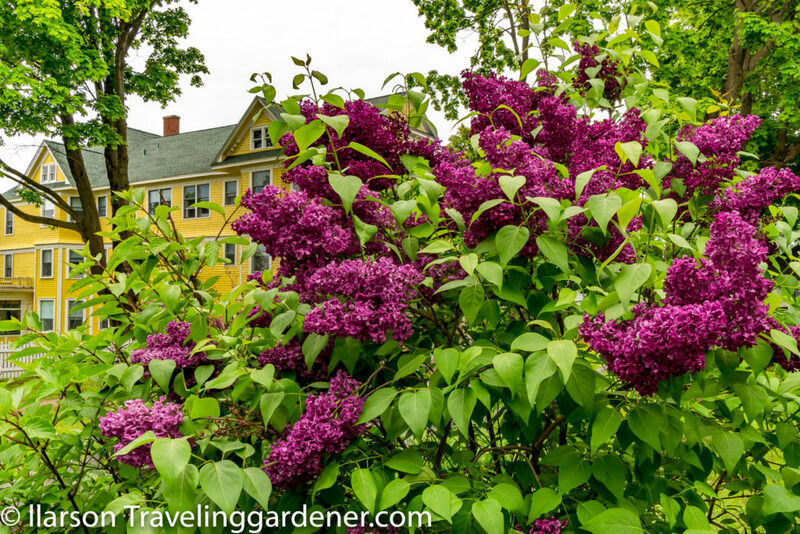 The view was spectacular, but best of all, outside our bedroom window was a 10′ lilac bush that bloomed every spring. The scent perfumed the room morning and night. 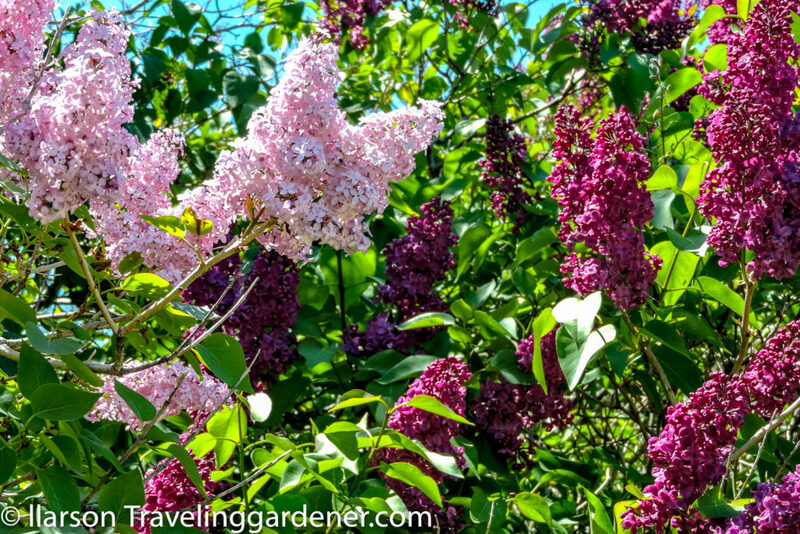 As a child in Indiana lilacs were a prominent element in the gardens of my Grandmothers and Aunts. Lilacs are the scent that immediately moves you back in time and memories of the moment flood over you. 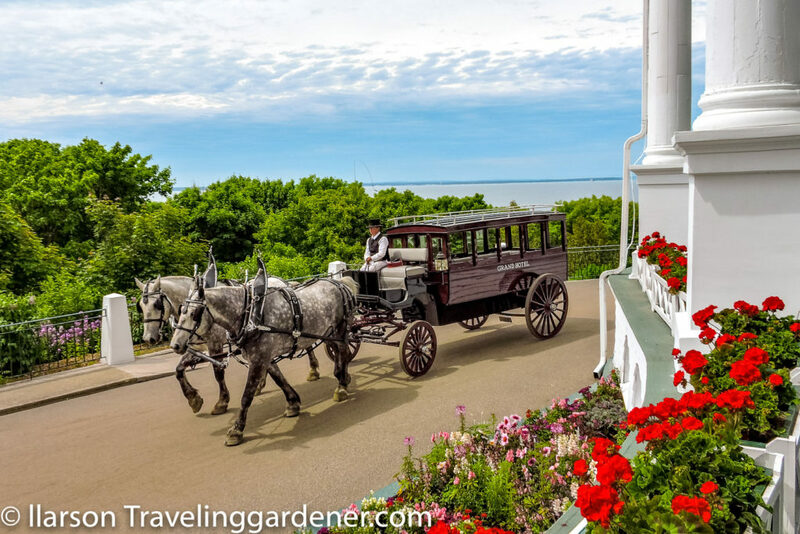 If you haven’t been to Mackinac Island to enjoy the lilacs, make plans to be there next year. 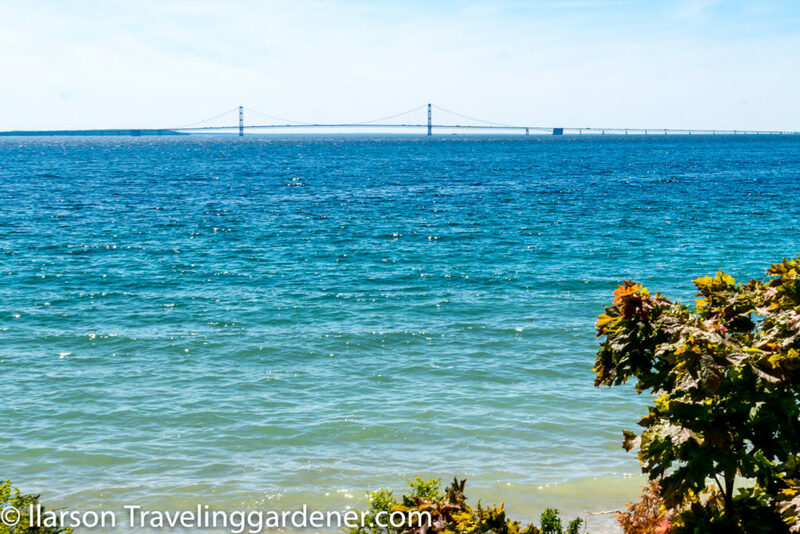 Below are some of my favorite images of Mackinac. Since I can’t grow lilacs in my garden I could paint them onto a bench! 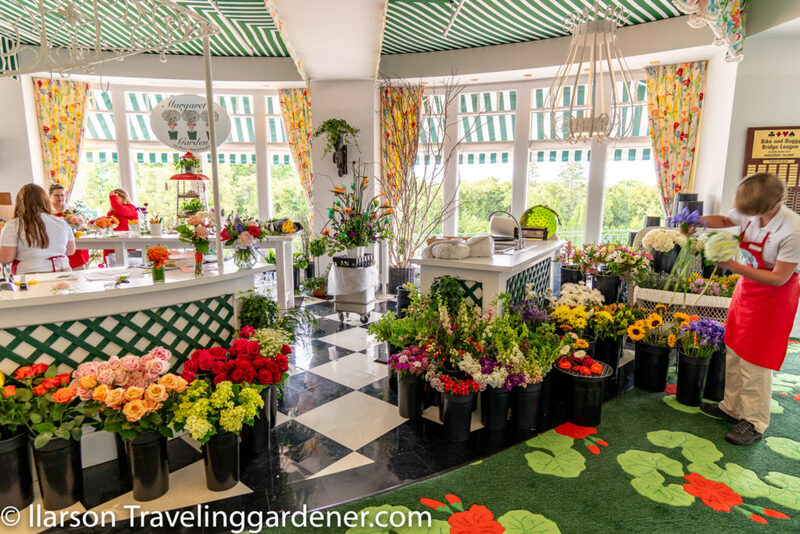 The flower shop inside the Grand Hotel, see the geranium carpet! I found the hotel greenhouse that keeps everything blooming! 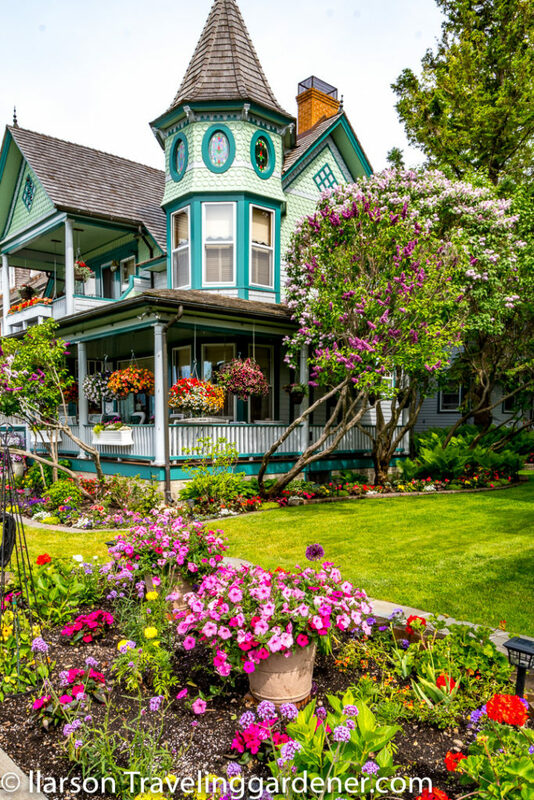 Why not paint your house to match your favorite flowers? 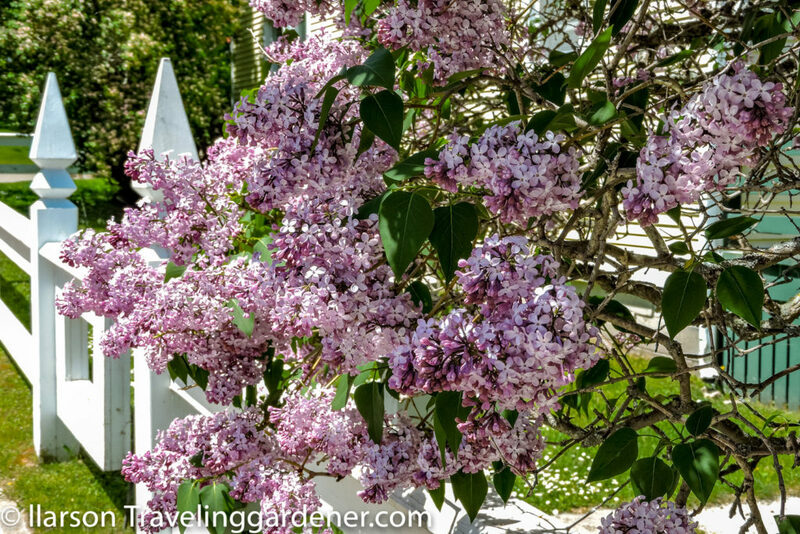 Yes, the lilacs on Mackinac Island are remarkable in every way. Beautiful!!! Looks so peaceful and picturesque! 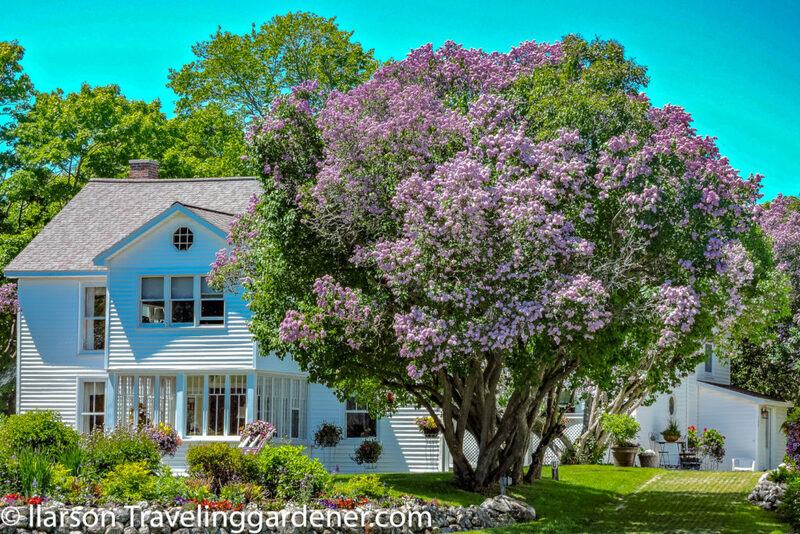 Thank you for these beautiful photos of two of my favorites – lilacs and the location for the delightful movie “Somewhere in Time”. 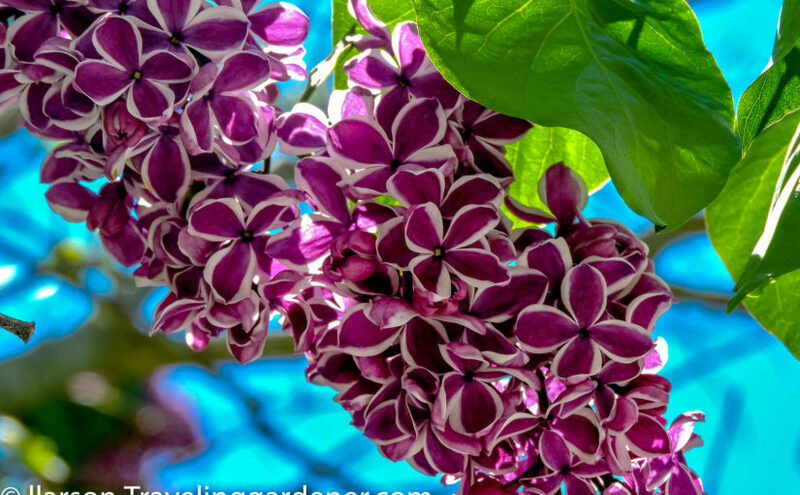 What love and care shines through in the lilacs. A visual treat! 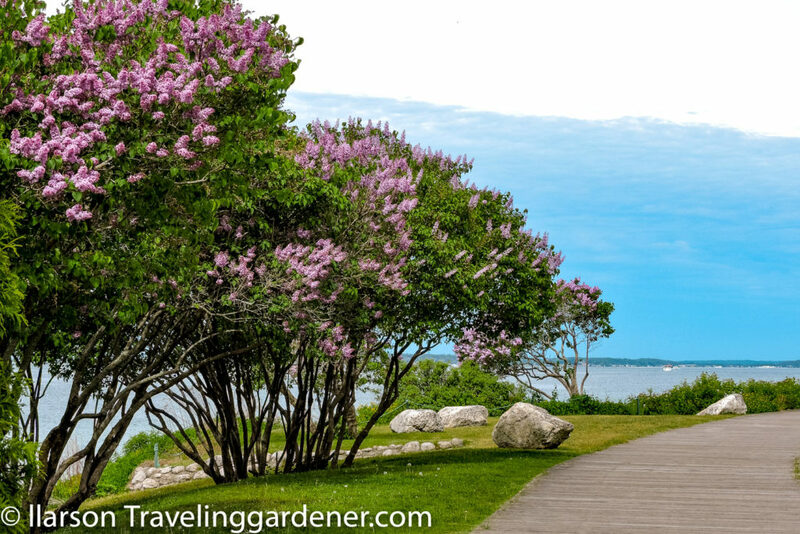 Mackanic Island will have to schedule another boat next year — for all of the readers of Traveling Gardener! It looks so wonderful! I’m not sure how I’ve missed visiting Mackinic Island. Many or most of my Wisconsin friends have been there. Good to finally see it through your visit. Thank you. Next Next post: A room with a garden too!